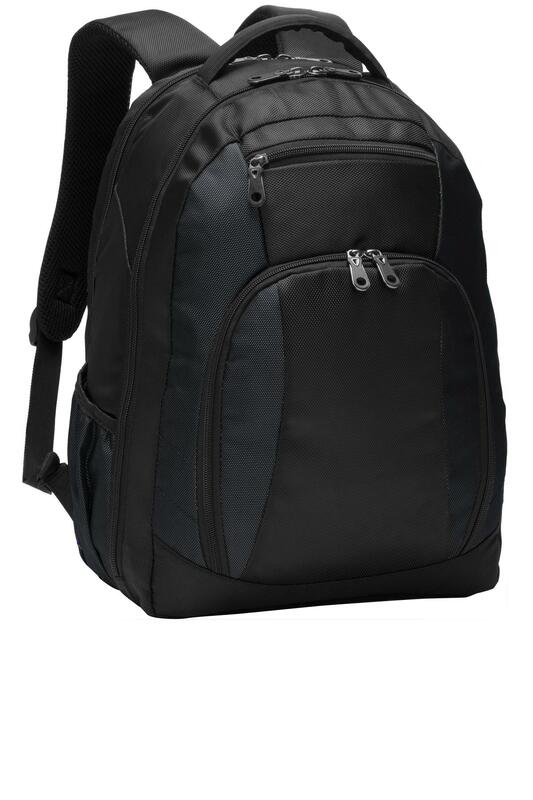 Our expansive durable backpack has a checkpoint-friendly clamshell opening-making it user-friendly while safeguarding your laptop and tablet. Coordinates with the Commuter Brief (BG307 sold separately). 1 680 denier ballistic polyester in solid and two-tone accentsBack laptop clamshell compartment with paddingCenter compartment with interior file dividerTricot-lined zippered pocketFront organization panelErgonomic adjustable padded shoulder straps Web top handlePullman handle attachment strap Laptop sleeve dimensions: 12 h x 12 w x 1 d; fits most 15 laptops Dimensions: 17 h x 12 w x 8 d; Approx. 1 632 cubic inches Note: Bags not intended for use by children 12 and under. Includes a California Prop 65 and social responsibility hangtag.